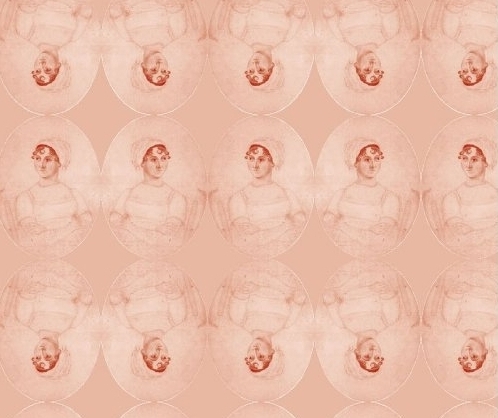 On May 18th the highly anticipated new book, Jane Austen’s Cults and Cultures, by the eminent Jane Austen scholar, Dr. Claudia Johnson, releases from The University of Chicago Press. Described as an “insightful look at how and why readers have cherished one of our most beloved authors” Johnson delves into the history of Austen’s enthusiasts through the centuries. The following excerpt is from Chapter 2, “Jane Austen’s Magic,” which discusses versions of Victorian Janeism that link Austen with enchantment, indeed even with the fairy world that is full of magic despite its apparently humdrum appearance. When Hill and her sister arrive at the village of Steventon, they cannot find the rectory where Austen was born (it had been torn down in the 1820s by Austen’s brother Edward who, oblivious of its hallowed status as Austen’s birthplace, built a better house there for his son’s use). With the marvelous appearance of an aged informant related to servants in the Austen household, they locate “a pump in the middle o’ the field” which “stood i’ the washhouse at the back o’ the parsonage” (Hill, 8). Though “barely noticed before,” the pump [see FIG 002.002] “become[s] interesting now as the only visible relic of the Austen’s home” (Hill, 10). As the sketch indicates, the view of the pump clearly lacks the patent if somewhat shabby materiality that countless photographs imparted to, say, Ann Hathaway’s cottage, and the site and sight of the pump would look even more absurd as a photograph. Its primary purpose, after all, is to represent the absence of the Steventon rectory. As a result, the burden of wondrous vision is placed on the visitant – as when Ellen Hill is drawing the pump, and Constance, gazing upon the blank space, muses “I can now picture to myself the exact spot where the parsonage stood, and can fancy the carriage drive approaching it . . . I can even fancy the house itself…” (Hill, 10-11). 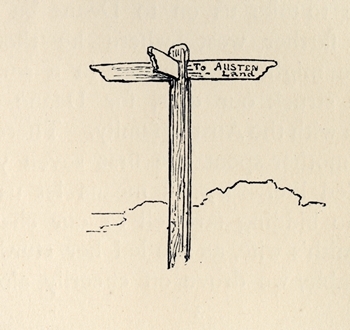 In cases where Austenian remnants are actually extant, they are not always bewitching and, in the nineteenth century, made no part of the pilgrimage. Chawton Cottage, to take the most conspicuous example, is an authentic and extant Austenian home, but it was so far from charming that J.E. Austen-Leigh not only declines to represent it in his Memoir, but he also actively discourages “any admirer of Jane Austen to undertake a pilgrimage to the spot,” because it has now been “divided into tenements for labourers” and “reverted to ordinary uses.” (Memoir, 69). A comparison between Ellen Hill’s partial, highly idealized sketch and a contemporary 1910 photograph of Chawton Cottage demonstrates just how much imaginative work is required from the visitor bent on Austenian enchantment when confronted with such refractorily unlovely but actual material. [ii] I am much indebted to Deidre Lynch, “Homes and Haunts: Austen’s and Mitford’s English Idylls,” PMLA 115, no. 5 (October, 2000), 1103-1108; the essays in Nicola Watson, ed., Literary Tourism and Nineteenth-Century Culture, (Houndmills: Palgrave/Macmillan, 2009), Harald Henrix, ed., Writers’ Houses and the Making of Memory (New York: Routledge, 2008) and Nicola Watson, The Literary Tourist: Readers and Places in Romantic & Victorian Britain (Basingstoke: Palgrave/Macmillan, 2006). 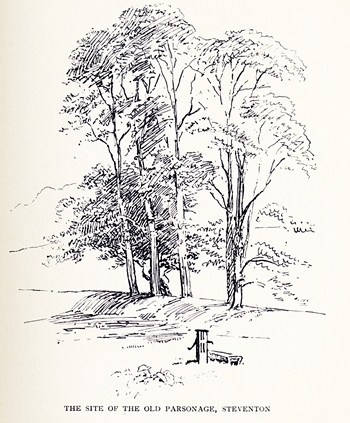 [iii] See Chapter 2 (“Shakespeare Land”) of John Taylor, A Dream of England: Landscape, Photography and the Tourist’s Imagination (Manchester and New York: Manchester University Press, 1994), 64-89. Claudia L. Johnson is the Murray Professor of English Literature and Chair of the English Department at Princeton University. She specializes in eighteenth- and early nineteenth-century literature, with a particular emphasis on the novel. In addition to eighteenth-century survey courses, she teaches courses about prose style, gothic fiction, sentimentalism, the emergence of nationalism, film adaptations of fiction, Samuel Johnson, and, of course, Jane Austen. Her books include Jane Austen: Women, Politics, and the Novel (Chicago, 1988), Equivocal Beings: Politics, Gender and Sentimentality in the 1790s (Chicago, 1995), and The Cambridge Companion to Mary Wollstonecraft (Cambridge, 2002), with Clara Tuite The Blackwell Companion to Jane Austen (2005). She has also prepared with editions of Jane Austen’s Mansfield Park (Norton, 1998), Sense and Sensibility (Norton, 2002), and Northanger Abbey (Oxford, 2003). At present she is writing a book on novel studies tentatively entitled, Raising the Novel. She enjoys singing and gazing out the window, though not necessarily at the same time. 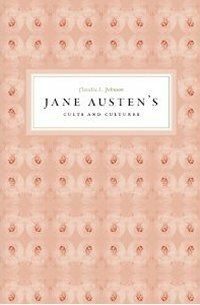 Enter a chance to win one of three copies available of Jane Austen’s Cults and Cultures by leaving a comment by 11:59 pm PT, Wednesday, May 23, 2012, stating why you are a member of the cult of Jane. Winners will be chosen at random and announced on Thursday, May 24, 2012. Shipment to US addresses only. Good luck! Pre-order your copy today from The University of Chicago Press or your favorite online book retailer. Reprinted with permission from Jane Austen’s Cults and Cultures, by Claudia L. Johnson, published by The University of Chicago Press. © 2012 by The University of Chicago. All rights reserved. « Mercy’s Embrace: Elizabeth Elliot’s Story, Book 1: So Rough a Course, by Laura Hile – A Review & Giveaway! I am a member of the cult of Jane because her characters and eloquence have given me so much strength in this ever-changing world. Her novels have given me strength to keep pushing forward. As a teen, it is important to have someone to look up to so as to not follow the wrong paths. humor and the nuances of her irony. I was fortunate to hear Dr. Johnson at a JASNA AGM Conference, and she was an amazing speaker. She had so much knowledge of Austen ,yet she seemed not to have lost the common touch that enabled her to connect with the entire audience, not just the academic wing of it. I hadn’t heard this book was coming out but it sounds so interesting that I’m sure I’ll be reading it before the year is out. Much as I would love to win a copy of this book, I can’t claim to be a part of the cult of Jane, though I have several shelves of not only her books and books about her and knick-knacks picked up at JASNA AGMs, etc., because I’m not really obsessed. Heck, I haven’t even visited Chawton! But, she remains one of my favorite author and one I discovered early and never tire of. “Literary Tourism” … what a splendid term! I enjoyed the excerpt. It’s something to meet admirers of Jane’s from another era. It’s hard to pin down why I am drawn to her works again and again. I suppose it’s her characters—so varied, and yet so true to life. They resonate. What I have learned from Jane Austen about people is a lot! I would truly be remiss if I did not confess that I cannot get enough Jane Austen and your generous offer is no exception! I am a member of the cult of Jane because she represents everything about Englishness that I love. Isn’t the cult of Jane just part of life?? It is to me!! Thank you for this wonderful chance to win this book. Wow, this looks interesting! I’d no idea that Austen scholarship went back so far as the Victorian period. I would consider myself only a peripheral member of the cult. I enjoyed the books by Austen that I’ve read (unfortunately, not all of them – yet), and I also love seeing what others do with her inspirations. I don’t know if I’m fully a member of the Cult of Jane, but Persuasion is one of the most romantic stories I’ve ever read. I’m definitely an adherent of the Cult of Jane. Her insight and her sense of whimsy make her books perfect anytime reading that is challenging in just the right way–not because I need a dictionary to interpret them but because I need to ponder on my own life and my own personal relationships with friends, relatives, and lovers to get something out of them. Austen challenges readers’ *emotional* intelligence. This is the perfect book for all Austen lovers. It will help to really get as much out of her books as possible. Hope I win a copy! I’m a cult member because I know that I can open any of her books to any page and find something wise, witty, and/or graceful. I would love to read this book! Thanks for the giveaway. “The cult of Jane”. I guess I never really thought of it that way. I think what draws me most to Austen’s books is her devotion to realism and the social commentary she infuses into her stories. Her works are similar to those of Dickens, another favorite, in those respects. Thanks for the chance to win this cool new book. Jane Austen’s characters and their conditions lend themselves to re-reading so well. Her insights and wit create layers that allow each re-read to lead to something new.Definitely a member! I would love to own this book! This book sounds very interesting-I would love to win a copy. I would love to win a copy (and I’m sorry if this is a duplicate-having some log-in issues). A cult suggests to me a ‘blinded’ following to a particular figure who promises to save your soul. The writings of Jane Austen assure us that we all have souls, and hence, the added comfort of being connected to each other. I look forward to Ms. Johnson’s thoughts! I’m so excited about this book. I’ve seen it listed on amazon for awhile now, I’m so glad it’s available now. I’d love to win! Why am I in the Jane Cult? When I rediscovered her many years ago, I couldn’t stop re-reading her books. I love her words and her characters are like friends. I thought I’d gone mad, then I found a group of friends that love Jane just as much as I do. Jane Austen has helped me to find life long friendships. I am an admirer of Jane because her characters are very similar to people I know today. I enjoy seeing how she maneuvers the plots to solve their delimmas. I have enjoyed Austen’s heroine/hero characters and the quirks of the supporting characters. I was first drawn to P&P years ago and thru FF have developed online friends from across the globe that share the same love of Austen that I do. How her influence 200 years later could not be treasured is anyone’s guess. Am I an adherent to the Cult of Jane? You betcha – I’ve even danced a quadrille at Chawton Great House. Why do I belong? It’s her amazing ability to draw the personalities of her characters, in so few words. I KNOW some of those people. In fact, I’m sure Jane has been spying on my family. Her Mrs. Elton is exactly like my cousin. is because of her strength and being a woman before her time! I have read Ms. Johnson’s Jane Austen: Women, Politics, and the Novel (Chicago, 1988) and was quite amazed – Ms. Austen’s consideration of contemporary issues is brought forward clearly by Ms. Johnson. I was quite impressed by the organization of Ms. Johnson’s work – by Austen novel title – bringing out the particular points in the novel(s) with the chapter topic – very well done. Look forward to reading this new work: Jane Austen’s Cults and Cultures. As a writer, I know how much authors rely on scholars to help give us all a clearer view of the masters like Austen. How on earth could someone as smart as Henry James say that Austen’s heroines had “small and second-rate minds” and call them “perfect little she-Philistines”? He was just jealous because he could not write that way. Nobody else could either! Our Miss Austen: Totally unique in all of literature! No one has before or since been able to turn a phrase like Jane Austen. The sentences she constructed are works of art…and she created Henry Tilney! She was a genius. I am a member of the cult of Jane, because every time I read her work, it is better, fresher, and more complex than ever before. She converts people into English majors (yay!). I’m so excited about Johnson’s book! Jane a cult? It is part of my life. I love Jane Austen and at times it is a kind of mystery …why am I so drawn to her? I feel and I see a part of me in her writtings. I would LOVE this book!! I’m part of the cult of jane austen since I read and reread her books and re lated to her. I even do research on her time period too and watch anything re lated to jane too. I’m a member of the cult of Jane because I’m an Anglophile and I like historical books (okay, that pertains to the Jane Austen sequels that I read). I also like it when the book has a happy ending. I have seen a lot of the recent Austen movies and at first it was hard to get into the language and the Regency period, but then I was sucked in. Haven’t read all of her books yet, but I do own them all. I am certainly a member of the cult of Jane because whenever I walk into a bookstore, I always go straight to the Jane Austen section. I’ll pretty much walk out with any book about Jane that I don’t already own! I am devoted to Jane Austen because no other author has ever understood human nature better than she did. Or was as funny.